I first stumbled onto Mrs. Limestones' blog, when I started writing my blog late this summer. It's still one of my favorites! I love reading about the adventures and surprises her and her husband have experienced while renovating and settling into their (quite beautiful) home in New York. So you can imagine how excited I am to guest post here! 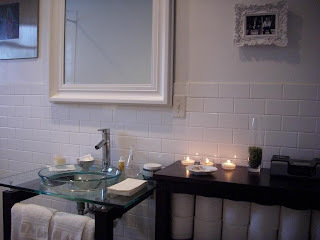 Today, I'm going to share a guest bathroom that I remodeled not too long ago. When I first bought my 1958 Florida bungalow in 2005, both of the bathrooms were, well, a nightmare, to say the least. The kitschy light fixtures. The pastel pink and aqua blue Grease era tiles. The pint size porcelain toilets and teeny tiny vanities that were crammed into areas so small, that brushing your teeth, showering, and flushing the toilet could easily be accomplished at the same time. Without moving your feet. The guest bathroom, in particular, wasn't much more than a glorified shoe box. Every single thing in it had to be replaced right down to the messy plaster walls. Many, many evenings were spent hauling out chalk white rubble. It's amazing how much dust and debris a few walls of tile and plaster can produce. When I put it back together, I went for a locally influenced aesthetic; sort of a clean, South Beach bungalow flavor. Plus, thanks to a demolished linen closet in the hallway (which bought quite a few square feet), a bit of reconfiguring, and a complete rebuild of all of the surfaces, there is now enough room to break dance in the bathroom. Or just shower comfortably. Whichever you prefer. Oh and, if you watch the DIY Network’s show Bathtastic, keep your eyes peeled for my little ugly duckling Tinkle Town. She’ll be debuting her new look in March! -If you are replacing the lighting and/or drywall, make sure to install products specifically designed for moisture resistance. -Shop for materials in person to get an idea of quality and then compare prices online. Or, many times you can negotiate additional discounts by simply talking to a store manager. I put majority of my budget into the marble flooring and quality subway tiles, and then was very careful with the rest of my purchases. The vanity was a great find on Ebay, but I had to assemble it myself. Marble on the floors from Floor + Decor in Pompano Beach. Subway tile on the walls from Floor + Decor in Pompano Beach. Linens from The Horchow Collection, www.Horchow.com. Vessel sink with European hardware from Ebay. Shelving from Pottery Barn, www.PotteryBarn.com. Painted solid wood mirror from Home Depot. Frames and baskets from Target, www.Target.com. Drywall is Durock from Lowe's. Recessed lighting is Halo Lensed Shower Trim from Lowe's. Thanks so much to Kelly. If you want to see more about her, visit her blog, Tearing Up Houses. And if you missed my previous guest bloggers, please give these a look as well. Great makeover, Kelly! Would love that little sink for a reno we're planning for 2010. Love it! When I was house-hunting, we checked out a house with a pink bathroom EXACTLY like the one Kelly posted. It was a great price, and now, seeing Kelly's post, I can't believe I passed it up! so awesome and inspiring. hope you had a positively lovely holiday! anonymous, i have to admit to having a flicker of nostalgic attachment to the pink tiles; they reminded me of a bathroom that my grandmother had in oak park while i was growing up. but it was just a flicker. Good job - LOVE the after!! Gorgeous!!! Thanks for the inspiration- my husband and I just purchased a beach home and one of the bathrooms has to be gutted- I am loving that tile and the super clever t.p. storage!!!! Kelly has a great blog, lots of information and inspiration! That bathroom is just stunning. It takes imagination to see beyond the color of a certain decade. You did a fabulous job! Such a wonderful makeover - great job! This is so beautiful. I love the glass sink with the dark furniture. It's a great contrast.